Timelines is featured on the front page of US App Store! 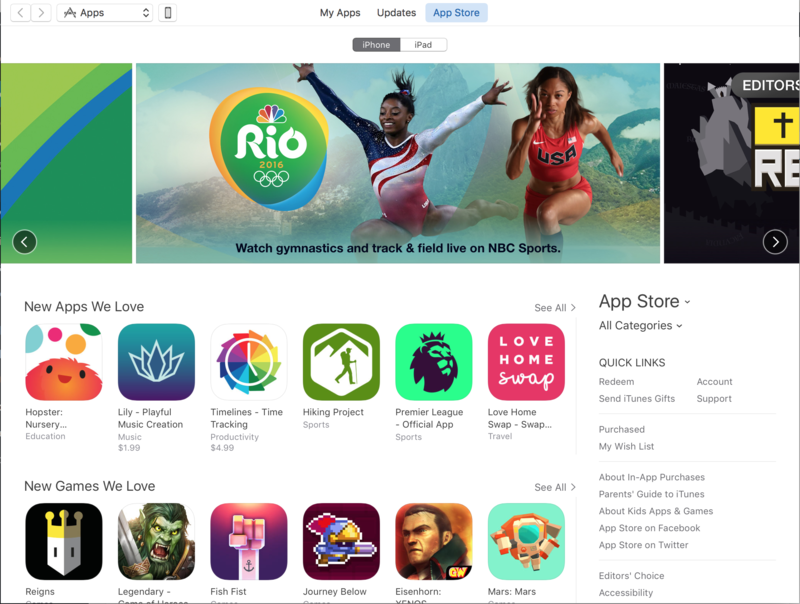 | Glimsoft Timelines is featured on the front page of US App Store! Timelines is featured on the front page of US App Store! I couldn’t sleep well today. I don’t know why, but I had a terrible dream that I still remember vividly. I woke up at 4AM, and after getting up, I went back to bed and checked the App Store. And there it was: my new app, Timelines, featured in the New Apps We Love section. Obviously, I had difficulty falling asleep after seeing it. At first, I was shocked. “Is this real, or am I dreaming?” Is this even possible. I was contacted by App Store team a few days earlier about providing banner artwork in case they decided to feature it somewhere, but from what I’ve read, that is still no guarantee that it will actually get featured. I checked again. Yes, it’s there. It’s happening! My mind was racing. I was thinking about how I got here, what this means and how it’s all somehow connected. It was some philosophical stuff. I decided I want to capture this moment in writing. After failing to fall asleep for the next ~hour, I eventually got up at 5AM, went downstairs and started typing this. I am actually on kind of a “vacation” now; on a cycling course, so I don’t have much time during the day. For people not in the Apple apps ecosystem: getting featured on the App Store is one of the best ways Apple can show that they find your app valuable and worthy of people’s attention. It’s a huge validation for every app developer. I remember when I first got the iPhone in ’08. It was a magical experience. Then I remember vividly in Summer ’08 the launch of the App Store. I was still a kid, and I didn’t know exactly what it meant, but I knew it was going to be big. The January of ’09, I started learning programming in C. I had no prior experience with websites, no guidance, no nothing. It took me several months just to get to know the basics, but I quickly fell in love with it. The thrill of taking a problem, breaking it down and coming up with solution – it felt great. I felt like I’d found something to be ‘mine’. Something that will get me out of some of the challenges I was going through at that time. I put so much hope in it. Programming in itself was great, but I especially loved the practicality of it. And I still loved my first-generation iPhone. I was intrigued to build an app on my own. Building something that other people would then use sounded exciting. In Fall ’09 I started learning Obj-C and building my own app. It took me again quite some time before I figured out how this object-oriented programming works. But I kept improving. In January ’10, I released my first app, Quadratic Master. And then it came – a cold shower. The numbers of downloads were way lower than I expected. But I still loved it. I built a much improved version 2.0 and released it in September that year. I also put it for free during the summer and the big spike in downloads was exciting. In Summer 2011, I got an idea for a fitness tracking app. The situation in this space on the App Store looked dire, so it seemed like a good idea. I was working on and off on it for 2 years. I finished high school in June ’12, and then was in the first year of university. Looking at it now, I overstep. In a way, the scope of the app was way over my abilities at that time. I struggled with it so incredibly much, but I somehow knew I have to finish it. I wanted to have that precedence for myself that when I decide to finish something, I finish it, no matter what. This is way easier to say than to actually do. Especially when you are as much of a perfectionist as I am. Routie is still near and dear to my heart and it has a decent fan base, but in terms of revenue it didn’t really live up to my hopes, and in the midst of everything else, I wasn’t able to turn it around. I kept working on it updates for another year, and beyond. I was still at university at that time. In May ’14, I got an idea for a time tracking app. It would display events on an interactive timeline. I completely fell in love with the idea. After a few days of chewing on it in my head, I knew I have to build it. And thanks to that precedence with Routie, I knew that once I decided that, it’s happening. It might take longer and I might take away some features for the initial release, but it is launching, so help me god. Again, it was a huge struggle. There were several client project, one of which failed terribly. I lost almost 3 months to it. Sometime around April 2015, I started working on it full time. At that time, I still believed I will launch it in time for the release of iOS 9 and watchOS 2 in September ’15. That didn’t happen. I went broke, and I had to take a full time job. This time, I wanted to make some kind of nest that would allow me to not worry about money for at least some time. I ended up working for a US company for 6 months, only having little time and attention left for Timelines. At times, I watched the excitement dying down. In September, I was confident I’ll release it by the end of the year. In December, there were only “a few things” left, so I thought I’ll release it in January ’16. Then in April, when the complete functionality was done, I felt it was pretty much done. But I took my lesson with Routie – this time, I wanted to release it properly. I spent a lot of time building a solid website for it. And Press Kit. And as incredibly “late” as it sounds, I finished all that near the end of July, and ultimately launched Timelines on 9th August. But that’s not all. I tried to contact influential journalists but I didn’t manage to get any press coverage on the launch day. I can literally feel all those “App Store experts” saying “Booo. That’s a bummer.”. What I did manage to do was to peak the interest of a few key influentials in the independent iOS developers community. Both Joe Cieplinsky and Daniel Jalkut tweeted about the app, and I am incredibly grateful for that. Thanks to the immense followings of Daniel, the launch wasn’t a disaster after all. But I knew the traffic from that will die soon. What I was trying to say with this rant: For me, building apps is a long-term love-hate relationship. Most of the times I keep chipping at it and the light at the end of the tunnel seems to be almost infinitely small. I cherish those moments when I finish a feature in the app, or when some user sends me an email with kind words. At those times when it all seems too hard and I contemplate just quitting this wannabe indie lifestyle altogether, I try to remind myself that this is what I chose to do, and for good reasons. I love the creative freedom, the feeling of doing something meaningful, the sense that I am making this tiny improvement of life for this tiny number of people. And the feeling of doing it not because I want to impress my peers/society/whoever, but because I believe it’s my purpose to do that. I do it because I love it, and sometimes I almost dislike this never ending perseverance, because deep down I know I can’t really quit. I am way too invested in it, and taking a safe and “good” job somewhere would feel like selling out to me. I also can’t quit because I know these regrets over it would kill me. Ultimately, I also won’t quit because even after all those years, the idea that some people out there are using and enjoying what I’ve built still seems magical and exciting. So yes, it’s 2016, and in the face of all the skepticism in the indie community, I won’t quit and I am nowhere near of quitting. What I’d also like to say to whoever reading this: just two weeks ago, hell, just one week ago, my successes on the App Store were quite slim. Don’t just quit because it seems too hard. As cheesy as this advice might sound – it will all eventually work out. And even if it doesn’t, you can at least have the comforting feeling that you tried the very best. Decide what you do in life based on your most inner voice and feelings, not based on what parents/spouse/society expects from you. As Gary says, regrets are the worst. PS: This blog post is completely unedited and ‘raw’. Sorry for all the grammar mistakes that might be here. Congratulations! You did a great job and the app is totally deserve to be features in the US appStore. Today I found your amasing app Timelines. It’s beautiful, impressive and very easy managed. Your app made my day, because that is exactly what I desperately needed. Thank you so much for it! Really appreciate your time and hard work. And thank you for the post. Love it. I tried to be completely honest in it, I hope it didn’t come across as being too full of myself. Hopefully not. It’s great to hear that you’ll have use for it. As I said in one of the previous blog posts, I built it in part because I needed it myself. I would love to hear what you think of it once you tried it out bit more – if you think of a feature request or something. You can use the buttons inside the app in Settings, under the ‘Contact’ section. Thank you again for the kind words, it brightened my day :). Hi Lukas, I sent a letter to lukas at glimsoft dot com with a feature request and some ideas. I’m just wondering if you received it. I did receive it, and I am sorry I haven’t responded yet. Last week was quite crazy, because I was actually on a cycling course and had very little time left for all the work stuff. I will respond to you today.